That's one of the reasons we're changing things up by introducing a new year-round beer. 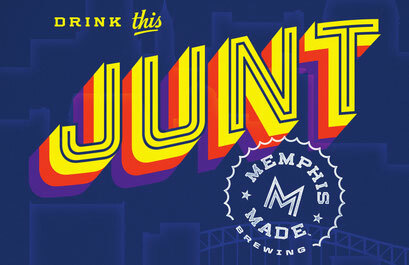 It's called Junt, a name very appropriate for Memphis Made Brewing. A smooth-drinking cream ale, this beer joins Cat Nap IPA and Fireside as a brew you can enjoy year-round. We think you'll like it. Of course, that's not all new we have. We've got Slumber Party, our Imperial Stout, back on at the tap room as well as a new limited release beer, Let It Snow, a dark saison. These two beers alone will help you get through this persistently cold weather we're experiencing in the Mid-South. We've got more than beer going on at the tap room this February. Bluff City Pinball is putting on the 4th Annual Tilted Hearts at our place again this year. This International Flipper Pinball Association sanctioned event is Saturday, Feb. 10. Registration is at 1:30 p.m. with the action starting at 2 p.m. There is a $10 entry fee and they’re using the three strikes format. Snowglobe is returning to brewery as well, with a show Saturday, Feb. 17 starting at 4 p.m.
Comma Comedians will have two shows at the tap room in February, the 10th and the 17th. Also, each Monday, they host the Bits on the Table comedy workshop 5 to 7 p.m. for those of you aspiring to be the next Chris Hardwick. We think this enough to help get you through to March and then spring. Hope to see you at the tap room or around town.